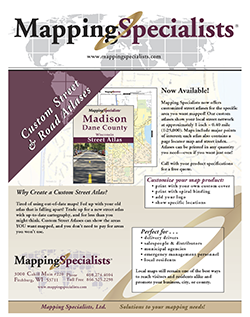 At Mapping Specialists, we work with you to create the maps you envision. We provide all of our cartographic services, from concept through delivery, in the most efficient and cost-effective means possible. This includes giving you the copyright and all of the native files so that you can use your maps in whatever ways you feel are necessary for your products. In effect, our goal is to become an extension of your project team. Whether you have one map or 100 maps to create, our staff is well-equipped to provide you with exactly what you need, when you need it. We look forward to working with you on your next graphics project and becoming part of your production team.